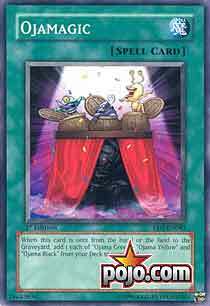 When this card is sent from the hand or the field to the Graveyard, add 1 each of "Ojama Green", "Ojama Yellow", and "Ojama Black" from your Deck to your hand. It's funny...one of the lowest of deck types gets one of the biggest pieces of hand advantage that others can only dream about. Ojamagic is a 3 for 1, a +2 advantage. Pot of Greed's a +1 and it's banned! *shakes fist angrily at UDE* Granted, you're only getting Ojamas but cards in hand usually aren't a bad thing. It's even better if your opponent wastes a Heavy Storm or Mystical Space Typhoon on this because then it's a 4 for 1. One thing to keep in mind though; you MUST have Green, Yellow, and Black all in your deck in order for Ojamagic to work. If they're not all there, you don't get any of them. However, for an Ojama based deck, this is still one of your core cards; you have more cards to work with if you pull it off and can set up for quick combos. Coin Flip Huh. So I discard you for Card Destruction and I get 3 free cards? It's like Christmas all over again. Oh, those 3 cards are 0/1000's… Hm. I cannot speak any words that will accurately convey how bad this card is outside of its intended deck. So here. Keep in mind that 1 is the absolute lowest rating I can give a card on the CotD. Alien men in bikinis… That is NEVER a good thing. I love seeing support for NON E-Hero decks in these new sets, and today's card is a staple in your Ojama deck. When Ojamagic is sent to your graveyard from your hand OR the field, you can bring one Ojama Yellow, Ojama Black, and Ojama Green respectively. This is obviously for use to summon your Ojama King about a billion times more easily. There isn't much else to say about this card. It's versatile, and you use it if you run the deck, or not. Ojama King Deck: 5/5 Yes, like yesterday, it's absolutely necessary for the deck. Two 5's in two days, now that's odd. Master Well, I got my chance to review some YuGiOh cards, so I decide to put down the dice and try a hand at reviewing with the other great reviewer we have. So, if mine is not good, read the other guys, you’ll like them :). Ok, so today’s CoTD is Ojamagic, a very handy Spell card. It is kind of like a Backup Soldier, only it works with only the Ojama people. Running this thing is great, there is no let downs for it… unless you run it in another deck. There is only one downside on the card: you have to get one of all three Ojama’s. You can’t get, like two Blacks and one Yellow. Its cool though – you DO get 3 more monsters into your hand, and might as well be the little guys. Perfect for getting ready to fuse into Ojama King. Ojama Deck: 5/5  what else WOULD it get! ?